Welcome to Cincy Birth Stories. We're so glad you're here. I'm Stacey, the face behind the camera and the doula behind the hip squeezes. I hope on this site that you'll find that we aren't just another photography company. I became a birth photographer out of a passion to document the most important moments of your life - the birth of your baby - the raw beauty and strength that you didn't know you were capable of and the look on your partner's face when they meet their new little love. Birth photography is my calling and I'm so humbled to have been able to be so welcomed as a birth photographer here in Cincinnati. Photographing births helped me discover my heart for women and families and doula work naturally came next. There is nothing in this world that gives me greater joy than supporting families as they grow and whether it be behind the camera or providing gentle coaching during labor. I'm so honored to work with you. The ability to share the visual story of your child's birth with them as they grow is such a gift and one I'm so grateful to provide. You are strong. You are brave. Let us tell your story. 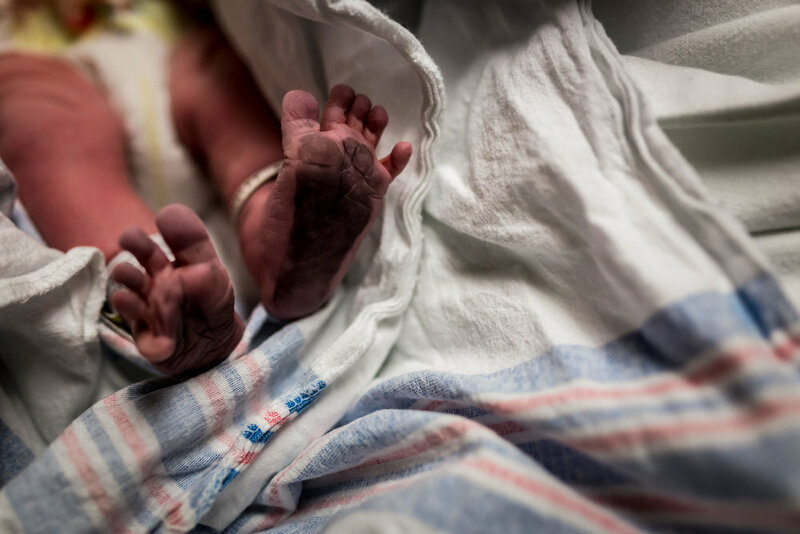 Cincy Birth Stories is proud to be the premier boutique Cincinnati birth photographers providing unparalleled quality, support and art to our clients. "I don't need a birth photographer. I'll just have my husband snap a few pictures." "You take pictures of the ACTUAL birth?" Lovely. We've got that out of the way! Those are the top two comments I get when I explain what I do. Birth photography is certainly still an up and coming art. We have been taught for so long that birth is scary, messy and something that should be swept under the rug and YES birth is messy. Birth is raw. Birth is incredibly vulnerable and so so beautiful. My number one goal as your birth photographer is to document the relationship between you and your partner, to capture your inner strength and to give you a visual time capsule of one of the most important days of your life. Birth photography captures: a father’s first time holding his newest love, first breaths, first cries and the overwhelming joy of meeting your new little one. The resulting photos are a gift to reflect upon during a time when fatigue and anticipation can make memories fade. THIS baby will be born only once and those tiny little details - that folded over ear, those wrinkly fingers - those are the memories that life is made of. You hire a wedding photographer to document the day you marry your partner and even more importantly we should capture the details of the day you meet the new little person you created together. Your family deserves to be able to fully immerse themselves in the joy that is birth and provide you with the support you need without worrying about handling a camera or taking photos. They are part of your story and should be in these important images. Are you a birth junkie? Sign up to receive birth positive films, stories and info straight to your email!We will never sell your info or send you spam.